Rube Goldberg's Foolish Questions postcards were a huge hit, but he also produced a set under the running title The Ancient Order of the Glass House. These were issued by the same company that did his Foolish Questions cards, which offers only their logo, intertwined initials B and S, as identification (Barton Spooner?). While the Foolish Questions cards were series 213, these were series 212, presumably meaning they were issued earlier. This particular example was postally used in 1910. By the way, I just stumbled upon Paul Tumey's essay about Goldberg's Foolish Questions. Recommended reading! I've seen similar sets to this (annoying people), which makes me wonder if these were based on a certain newspaper strip or not. Rube's comic strip for the Mail didn't have an over-arching running title, but did use many running titles for various recurring themes. 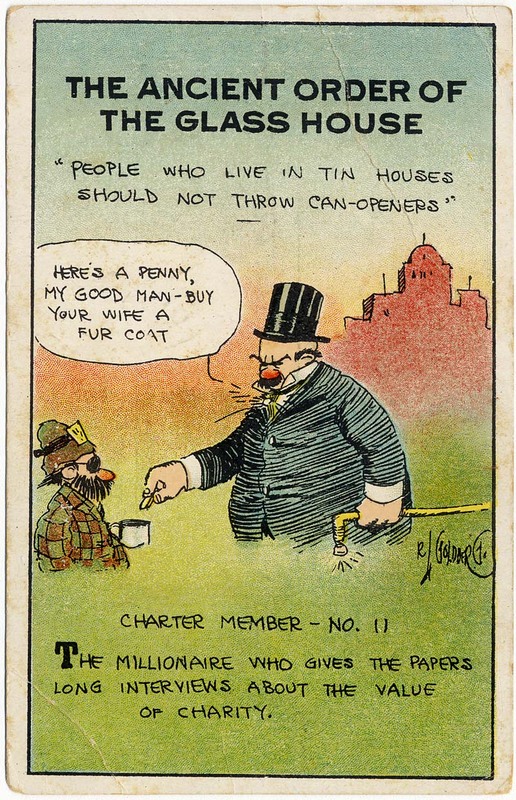 Although I don't have a bunch of pre-1910 strips here to look at, I'm confident that this was one of his recurring themes in the Mail series in that era.